Sam Shepard (The Right Stuff, The Assassin of Jesse James by the Coward Robert Ford) delivers "a charismatic performance" (Evening Standard) and "clearly relishes one of his best cinema roles in years" (Daily Express) inn the "elegiac, beautifully shot Western" (New York Post) Blackthorn. It's been said (but unsubstantiated) that Butch Cassidy and the Sundance Kid were killed in a standoff with the Bolivian military in 1908. In Blackthorn, Cassidy (Shepard) survived, and is quietly living out his years under the name James Blackthorn in a secluded Bolivian village. Tired of his long exile from the U.S. and hoping to see his family again before he dies, Cassidy sets out on the long journey home. However, when an unexpected encounter with an ambitious young criminal (Eduardo Noriega – The Devil's Backbone, Open Your Eyes) derails his plans, he is thrust into one last adventure, the likes of which he hasn't experienced since his glory days with the Sundance Kid. Co-starring Stephen Rea (Citizen X, The Crying Game) and Nicolaj Coster-Waldau (Game Of Thrones, Kingdom Of Heaven), Blackthorn was directed by three-time Goya winner Mateo Gil and was shot on location in the breathtaking Bolivian landscape, believed to be Cassidy's final resting place. 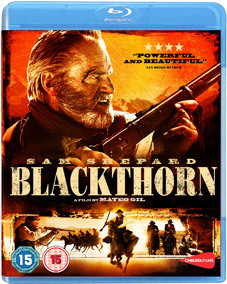 Blackthorn will be released on UK DVD and Blu-ray on 4th June 2012 by Chelsea Films at the RRP of £15.99 for the DVD and £17.99 for the Blu-ray. No extra features have been detailed as yet.